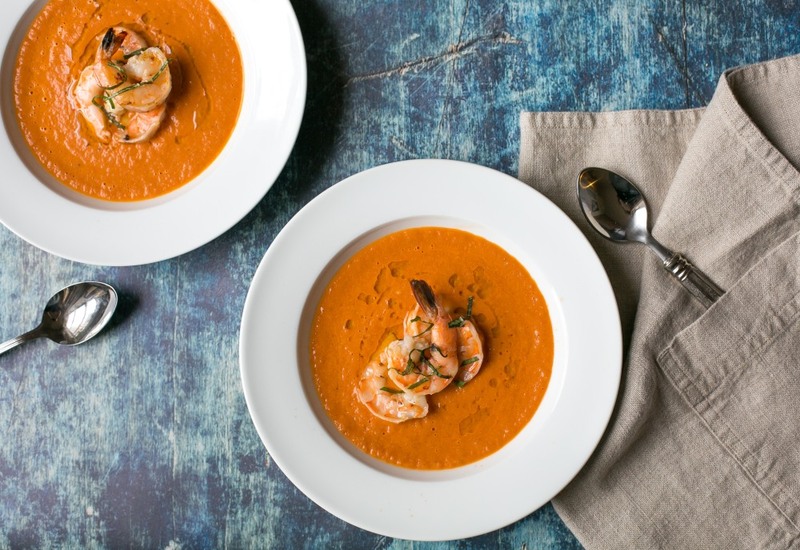 This rich and creamy soup is topped with grilled lemon shrimp and garnished with a pop of fresh basil. Smaller cup portions can be enjoyed as an appetizer course, or serve up a bowl of this soup and make it a meal. It is a great summertime dish when heirloom tomatoes can be found in all their beauty. Plus, it is a soup dish that gets you cooking outdoors on the grill! Definitely a unique recipe to serve during the warmer months. When grilling shrimp be sure to watch them carefully. Remove from the heat immediately when they turn opaque to avoid overcooking. Per Serving: 523 calories; 31g fat; 20.6g carbohydrates; 43g protein; 359mg cholesterol; 1777mg sodium. Simple and tasty - good way to use a bounty of tomatoes! I felt it needed time for the flavors to really develop so am leaving it overnight, looking forward to trying it again tomorrow. This was a very healthy tomato soup. Tasted fresh and acidic. The addition of the shrimp was a nice touch. Would make this soup again with a grilled cheese or with a touch of cream. Amazing! It's puts your mom's tomato soup to shame! It pairs perfectly with a grilled cheese or a thick slice of crusty bread. Definitely going to make this soup again.